A fanedit to drastically (as much as possible) change the movie we saw in the theater for the better. THIS EDIT IS COMPLETE and AVAILABLE. GOAL: To reboot and repackage The Last Jedi with existing footage and new VFX to change the way we see the entire presentation in order to make it feel as much like a focused classic Star Wars movie as possible. It’s a very simple Star Wars story - it follows Luke, Rey and Kylo, while the rebels run from the First Order. This version is the ONLY way I watch this movie, and I quite enjoy it like this actually. 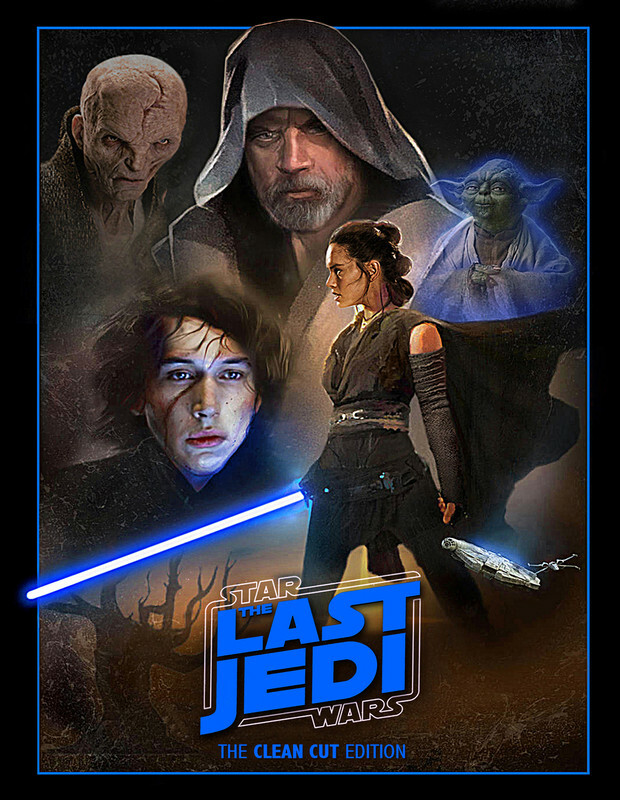 I’ve edited The Last Jedi down to the basics and void of all cringe. The goal was to shave it down to the basics and make it more “Luke” focused and play out more like an OT style story. 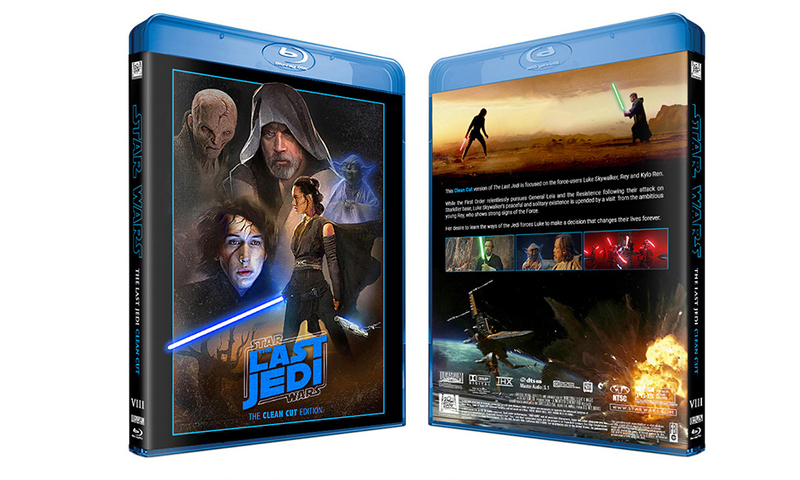 I really wanted to change the way we see this movie as drastically as possible while still maintaining continuity (with the exception of Rey’s new first encounter with Luke). I also really disliked the “red everything” marketing campaign, so this new movie poster is meant to change the overall tone. Inserted Ryan Glossemeyer’s “Luke saves Leia” scene. I think this was really well done and a powerful scene. Great way to give us more Luke and highlight the fact that he only uses the Force to save people at this point in his life. Luke saves Leia when she’s blasted into space… she comes back to the ship (with Luke’s help) and drops her homing beacon when placed on the strectcher - then cut to Rey’s homing beacon and Rey sleeping… works particularly well. Cut Holdo/Leia awkward “may the force be with you” and just let Holdo say it. Cut Rey force-grabbing Kylo’s saber in the Snoke confrontation, only to have it taken away from her a second later. 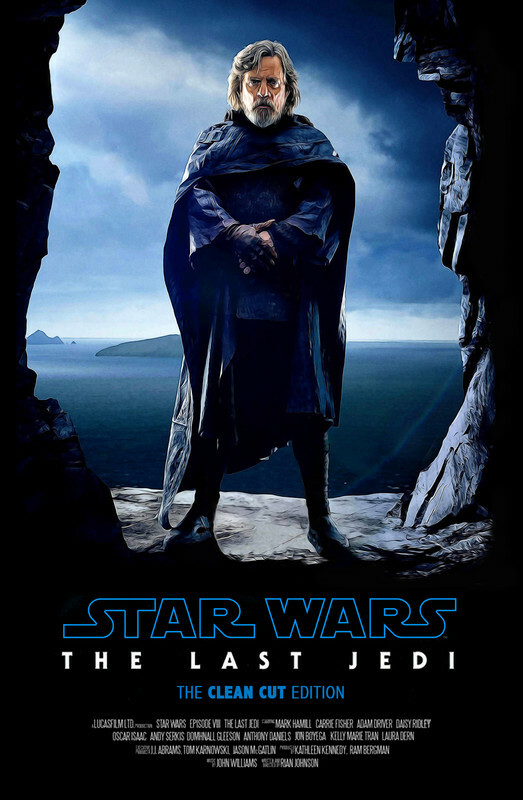 Luke doesn’t fade away - he is last seen on his “meditation rock” looking at the sunset and then we see the island from a distance and the sun goes down behind it (interpret it as you wish) - I’m 100% sure episode 9 will include some exposition saying “Luke has died” or something to that effect, so we really don’t have to SEE it happen in order maintain saga continuity with where EP9 starts off. Yeah, I’m curious - what is your final runtime? I’d be interested in a pm as well! Very curious how the climactic scene of Holdo’s attack works without the execution scene. I’ve created a V2 with the ‘Luke saves Leia’ scene inserted. See updated change list. I watched this last night and I was really impressed. I got a sense of the movie better and in a strange way I think I see the vision that Rian Johnson was going for. It opened me to some of the themes that were going on, that were always present but this enhanced them and put them better in the foreground. I am impressed with this edit. It is very close to how I might do it, very close. Well done! The two snippets I might want to remove are really just trims of scenes you already trimmed. The plug a hole and a new leak crops up BB8 scene and then the fonz, hit it with BB8’s head to fix it. Just have him go down and be competent by fixing it right away. The other was the puppy dog eyes of the porg. Maybe, Chewie gets it with the four birds scene and no need to draw that out with multiple shots of the porg puppy dog eyes. Oh and I thought of two more, overall Hux as a character is saved in this. There were two scenes though that I personally find jarring still in there. The one where Snoke from across the galaxy smashes Hux’s face on the ground. This has got to be humiliating for the leader of all the troops, at least Vader gave his men dignified deaths (and there was not galactic distances at work there). The other one is where Hux repeats the orders of Kylo in the floating shuttle. It is obnoxious. I realize you cut other instances of this and this is the remaining one, but I might be inclined to let that one go too. The Luke saving Leia scene is really well edited for the most part. I’m not a huge fan of the bombastic trailer music that was inserted toward the end of the scene though. Something more subtle would serve much better, I think. Thanks for taking the time to provide feedback - PM me if you’d like a link for V2! Glad you enjoyed it! I would have to agree with this as well. If there was a way to use some other music from the TLJ soundtrack, this scene would fit in a bit better. That being said, I would also like a link to this edit. It bothers me that Luke isn’t clean cut in the poster. Hello, please PM me, seems your cut is what i wanted to see in the cinemas. Your V2 Luke saves Leia scene is much, much, much better than what was in the movie!!! WOW!!! Hello, please PM me, seems your cut is great 😃. Wow, it seems really interesting, can’t wait to watch it! *There’s an awkward cut from Luke’s “Where’s Han” to the three of them sitting outside. Maybe add a scene in between to get rid of that slightly jarring transition? *An abrupt introduction to both Holdo and Rose. I know it’s from getting rid of most of their pointless scenes, but maybe you could find a way to make the scene where Finn meets Rose work in the context of this edit? Same for Holdo. I’m not sure if there would be a way to introduce Holdo without it leading into the Canto Bight subplot, but I think it would be a little less jarring and more impactful when it comes time for her to stay behind and sacrifice herself. *I would love for a higher bitrate version of this edit once it’s nearing completion! All in all though, I really enjoyed this and I will definitely be following this edit! •maybe reinstate Holdo’s speech to introduce her properly and to give Poe back some of his character’s act. All said, I really enjoyed this edit and I hope you will also male an higher bitrate version. Good job man! How do I watch this?